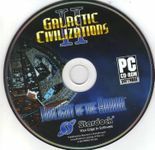 "Galactic Civilizations II: Twilight of the Arnor, released April 30, 2008, is the second expansion pack to the turn-based strategy video game Galactic Civilizations II: Dread Lords, following the first expansion pack Galactic Civilizations II: Dark Avatar, released February 2007. It has been affirmed by the developer, Stardock, that this is to be the last expansion. According to the backstory of the game's main campaign, the Drengin and the Korath races are at war, with the latter wishing to annihilate and the former merely to enslave the Galaxy"
Source: Wikipedia, "Galactic Civilizations II: Twilight of the Arnor", available under the CC-BY-SA License.